Any PDF Converter Pro is the best PDF converting software, which can convert any PDF files to multiple documents and images files. You can use this PDF file conversion app to convert scanned PDF to Word (.doc, .docx), Excel (.xlsx, .xls), PowerPoint (pptx), ePub, Rich Text Format (rtf), HTML, TEXT (txt) and more editable document formats. In addition, the any PDF converting software can also translate PDF to image files like JPEG (jpg), PNG, GIF, BMP, Tiff and more formats with high quality. Feel free to download the PDF Converter and enjoy its functions easily. 1. Convert any PDF files to editable document file like Office Word, Excel and more. 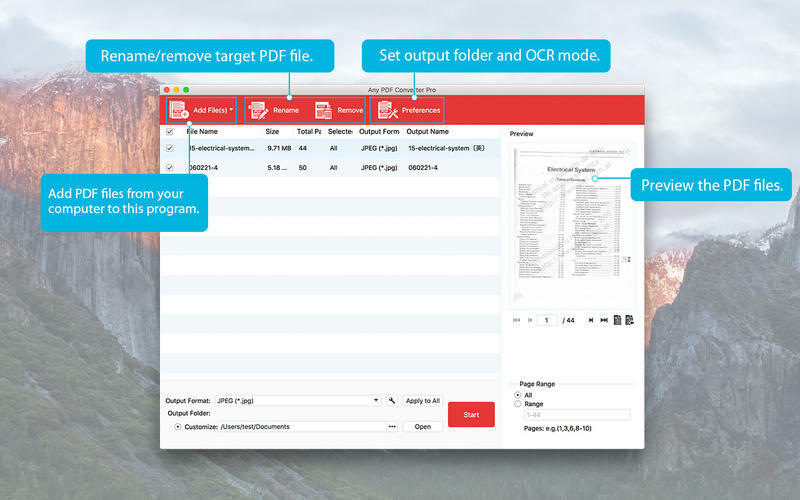 Need to edit the full content of PDF files? The easiest way is to convert PDF files to editable Word (docx/doc), Excel (xlsx/xls), Text, PowerPoint, RTF, ePub, etc. format with this PDF Converter quickly. At the same, it preserves the original text, images, layouts, hyperlinks, tables, and graphics with high accuracy. You don’t worry about any loss. Also, it can extract any text, images and more contents out from protected PDFs. 2. 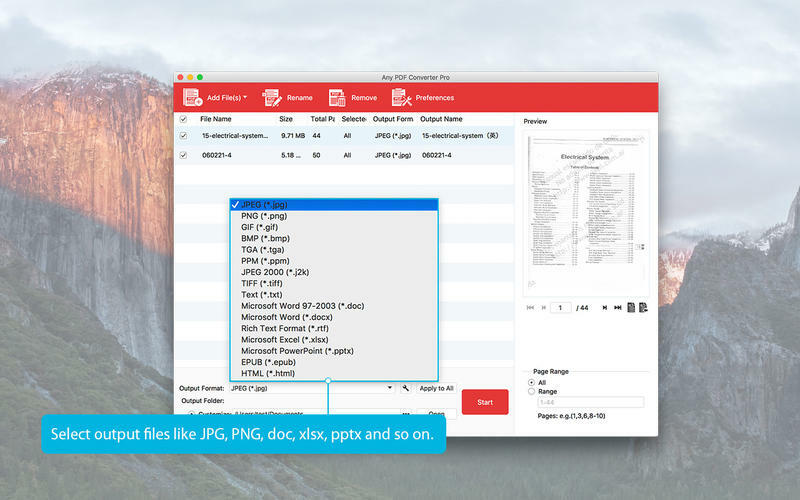 Convert any PDF files to various image formats like JPG, PNG, etc. As the best and powerful Adobe Acrobat alternative software, it can extract all photos and convert to TIFF, JPEG, PNG, GIF, BMP, TGA, PPM and JPEG2000 and more image file formats from any PDF files with on limitation. The applied advanced OCR technology can recognize all of the texts, images and more details in the PDF file accurately. You are allowed to choose three conversion modes: Accuracy, Balanced and Speed by selecting OCR from its “Preferences" window. Besides, it is highly compatible with multiple languages to fully meet your needs. With the supporting of OCR technology, the converted fully editable Word, Excel, PowerPoint presentation, ePub and more text-based documents maintain the original layout of the presentation with completing original fonts and embedded images, graphs/charts, text encoding and so on. The PDF file Converter provides you free options to set pixel size, image color, etc. for image formats. Its built-in player lets you play and preview the source PDF files which make the PDF conversion more convenient. You can free specify the page ranges or select specific page from each PDF file to convert. This PDF Converter software enables you to add and convert many PDF files at a time with one click. It saves your much time. With simple clicks, you'll finish creating PDF to images or word, excel, ppt, ePub and other document conversion. It can preserve all the elements of original PDF files like text, hyperlinks, images, layouts, tables, columns, graphics which makes it so easy for you to handle any PDF files.